Heat olive oil in a large pot over medium-high heat. Add the carrot, celery, garlic, shallot, and thyme; saute for 5 to 7 minutes. Add the broth, wine, sugar, bay leaf, and roasted peppers. Bring to a boil over high heat then decrease the heat to medium-low and continue cooking for 10 minutes to ensure the carrots and celery are tender. Cool the soup slightly, remove the bay leaf with a slotted spoon and add the heavy cream. With an immersion hand blender, puree the soup in the pot until it is smooth. (Soup can also be pureed in a standard blender.) With either method, use caution in blending the warm liquids. 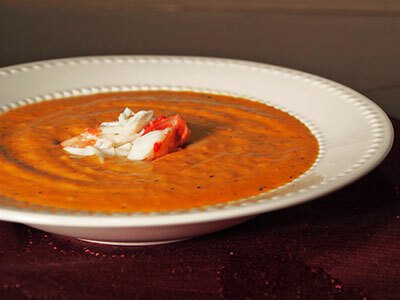 After blending the soup, stir in the crab meat. Heat soup, in large pot, over medium-high heat for 2 to 3 minutes to make sure soup is warm throughout. Season the soup, to taste, with salt and pepper.